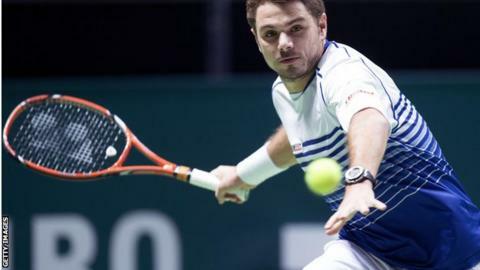 Switzerland's Stan Wawrinka came from a set down to beat last year's winner Tomas Berdych in the ABN Amro World Tennis Tournament final in Rotterdam. The fourth seed and world number eight won 4-6 6-3 6-4 against the Czech, one place above him in the world rankings. It was Wawrinka's sixth straight win against Berdych and the ninth title of his career. The Swiss, 29, secured a break at the end of the second, went 4-1 up in the third and survived a late fightback. Berdych, 29, bidding for this 11th career title, saved one match point when serving at 5-3 down, before Wawrinka clinched victory at the next opportunity on his own serve. Britain's Jamie Murray and Australian partner John Peers were beaten in the final of the doubles 3-6 6-3 10-8 by third seeds Jean-Julien Rojer and Horia Tecau.